I just bought shrimp last month. This looks like a perfect recipe for us! How spicy was it with the cayenne in the marinade? I actually used about half of what it called for and it still had a kick because of the pepper and curry. I also slightly blended the sauce because of my picky boy and I prefer the sauce that way. Last edited by Laurlor; 12-07-2018 at 05:13 PM. 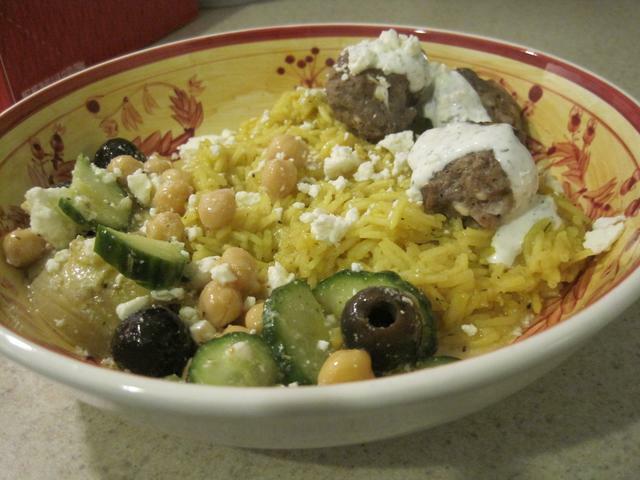 My version of a Greek bowl: Greek meatballs, yellow dill rice, Greek marinated salad (cuke, olive, red onion, chickpeas, artichokes, feta in a lemon vinaigrette), dill yogurt sauce, crumbled feta. : tu I usually use tomato sauce instead of diced tomatoes in meals like this. I don't like tomatoes, but sauce is okay. I love Greek food. Lemon, oregano, dill, feta are some of my most favorite flavors. I still need to perfect my dill yellow rice. I'm not sure why I can't get the texture right although the flavor was better this time. I wonder if I need to bloom the turmeric - maybe it needs to cook a little first so it doesn't give a chalky-like texture. I forgot to post anything from last week. This week we have one person having their wisdom teeth out so menus are going to be soft the second half of the week! We are doing chicken pot pie tonight. Tonight is Mahi-mahi with Thai Coconut Curry Sauce with the Coconut Rice from this recipe, and Prosciutto Wrapped Asparagus. I also made this Mocha Chocolate Icebox Cake because DD's boyfriend and youth leader are coming over for dinner. Last night I made Beef, Tomato and Acini di Pepe Soup, tonight is leftovers. I ate SOOO terribly the last couple of weeks and am actually looking forward to regular cooking again!